Most SaaS companies begin their cloud journeys in a public cloud using a service like Amazon's AWS. Looking for a cost-effective cloud solution to get their business off the ground, the public cloud ticks the boxes for low capital investment, minimised complexity, and high reliability. However, there comes a time as the business starts to grow when the advantages offered become overshadowed by security and compliance concerns, privacy issues, control, and the costs of scaling. Private cloud SaaS hosting eliminates all of these concerns through the provision of a dedicated and secure cloud-based environment that is accessible to one organisation only, spurring increasing numbers of SaaS companies to make the switch. Want to save a PDF version of this SaaS Hosting guide? Just enter your email below and we'll send you a copy. Also see: Private Cloud Hosting: Ultimate Guide for SaaS Businesses. No one can deny that public cloud hosting has many advantages for SaaS providers – particularly in the early stages of business development. All SaaS companies need to host their application somewhere, and in the startup phase when you’ve yet to prove there’s a market for your offering, breaking out the credit card and signing up with Amazon Web Services (AWS) or Microsoft Azure certainly makes sense. With cloud resources owned, operated and maintained by the public cloud service provider, the SaaS startup enjoys the benefit of infrastructure on tap, easy setup, no maintenance, and high reliability – a pretty ideal scenario. However, when the time comes to scale-up the business, there are certain SaaS providers with special requirements for heightened security, privacy, better cost predictability and performance who ultimately find having their own privately managed cloud hosting a much better option. While public clouds have their place, there are many good reasons to make the switch to private cloud SaaS hosting. 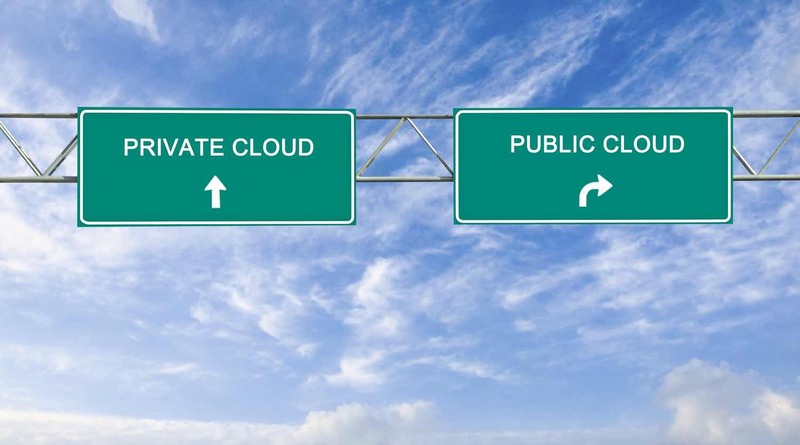 In fact, going private is a fast-growing trend, with businesses migrating their applications away from the public cloud at a staggering rate in favour of private cloud environments, according to a recent survey from research firm IDC. 80% of the 400 IT decision-makers who participated in IDC’s 2018 Cloud and AI Adoption Survey said that their organisation had migrated either applications or data that were part of a public cloud environment to a private cloud solution in the last year. Why are so many organisations moving their applications to a private cloud? According to the IDC report, the top reason businesses gave for moving away from public cloud was security. This chimes with further research from security vendor Ixia, which revealed in a report last year that 93% of IT professionals responsible for cloud deployments and management are concerned about data and application security in public clouds. In addition, nearly 60% report that public cloud environments make it more difficult to obtain visibility into data traffic, and 88% have experienced a business-related issue from a lack of visibility into public cloud traffic. One of the biggest downsides of public cloud is that you will be hosting your application in a multi-tenant environment – which is to say that you are sharing the same hardware, storage and network devices with other businesses using the same service. This means that the attack surface is greater – a cyberattack against another company sharing your server could potentially impact your application and operations. Private cloud SaaS hosting, on the other hand, is a single-tenant solution that utilises a private network (access to the cloud is through private channels and not over the internet). This means you have dedicated hardware that can be configured to your precise security requirements for the sole use of your company alone. For businesses dealing with sensitive customer data, such as medical or financial records, it is absolutely vital that this data is completely and securely ring-fenced from everybody but your firm – not least to meet various regulatory requirements. In a public cloud scenario – where you are utilising the public internet to transfer data in and out of your servers – you are essentially exposing user and customer data to potential network hijacking and various other external threats. Of course, it is in the interest of public cloud providers to provide top-notch security for their business customers, and they indeed invest heavily in ensuring that all users are adequately protected. However, for companies who handle regulated data – such as those operating in the finance, government and healthcare industries – security requirements are very specific, and it is simply untenable to allow that data to be stored in a third-party environment. With private cloud SaaS hosting, you can build a custom compliance strategy that meets your organisation’s precise privacy, security and regulatory compliance needs, and have maximum visibility and control. Companies moving to private cloud SaaS hosting can also benefit hugely by teaming up with a managed cloud hosting provider like Zsah, who offer expert, around-the-clock services – including DDoS attack mitigation, load balancing, firewalls, data backups and vulnerability scans – to ensure maximum security and protect your organisation’s data at all times. Public cloud infrastructure is owned by largescale third-party providers. As such, all resources are highly standardised to be of use to as many customers as possible. This means that the ability to customise those resources to your business’s precise SaaS hosting requirements are limited. You get what you get, in other words. Conversely, a private cloud is your cloud, and it can be customised however you like. Private cloud solutions can be built from the ground up, and designed from the very start to meet the exact needs of your SaaS application, your business, and your customers. Private clouds can reside within the walls of your organisation’s offices or data centre (known as on-premises or internal clouds), or the infrastructure can be outsourced to a third party like Zsah. A private cloud from Zsah meets all the SaaS hosting requirements SaaS providers have. Our purpose-built application Adaptive Private Cloud (APC) architecture is designed to host all manner of SaaS applications, can be set up entirely according to your precise conditions, and provides you with complete control over data, security, and all other resources. Hosting your application with a private cloud provider also means that you can take advantage of having your cloud environment completely managed and maintained for you, allowing you to focus on doing what you do best – developing fantastic applications. You retain complete ownership of the ongoing design and development of your SaaS platform, while the private cloud provider manages the infrastructure on your behalf. Aside from control, flexibility, strong security and regulatory compliance, another huge benefit of private cloud SaaS hosting can be cost savings. Low costs are generally considered to be the primary benefit of utilising public cloud services. While it’s true that public clouds offer a low-cost solution for many SaaS providers at the start of their cloud journeys, over time, as they endeavour to scale the business, public cloud bills can in fact prove more costly than running and maintaining a private cloud. A recent Twitter poll conducted by zsah shows that users of AWS, Azure and Google Cloud had all received unexpectedly large bills for their public cloud hosting in the past. The reason being that if a SaaS company’s application rises in popularity, so too does its usage, requiring additional resources from the public cloud. But these additional resources increase overall costs, and there comes a point when scaling in a public cloud can get very expensive indeed. As such, SaaS companies utilising public cloud need to take great care to calculate potential future cloud costs against anticipated growth predictions. Despite common perceptions of public cloud being less expensive, private cloud has in fact been shown to be the more cost-effective solution for many businesses. A study by 451 Research revealed that 41% of IT decision-makers found their private cloud to be less expensive than a comparable public cloud, with 9% indicating that they saved at least 50% in a private cloud compared to what they paid for public cloud consumption. Aside from scaling costs, the report suggests that many users can also overlook hidden charges in the public cloud, and don’t become aware of the total cost of ownership (TCO) of a public cloud until the bill arrives. As the public cloud has grown in popularity, providers have expanded their service offerings to include things like storage, compute, networking, analytics, databases, management tools, security and enterprise applications. With such a large selection, it can be difficult for SaaS companies to choose only the solutions they require. Oftentimes, additional services are selected which the SaaS company doesn’t need, resulting in many unused purchases adding to monthly bills, and the company paying more than necessary. With private cloud SaaS hosting, the cloud environment will be built for your precise requirements, without you ever having to purchase more than you need. The provider will evaluate your goals, and design a SaaS hosting solution to meet them, with the flexibility to scale up or down as your needs change over time. While of course private cloud won’t always cost less than public cloud – nearly a quarter of the respondents in the 451 report said they pay up to 10% more to use a private cloud than a public one – organisations still benefit from other advantages, including greater control and increased security, which are well worth it when compliance and/or growth requirements need to be met. More and more SaaS companies are choosing private cloud SaaS hosting for their applications. Whether it’s due to the need for additional security, customisation, data control, or cost-effective scaling, the advantages of private cloud SaaS hosting offer many good reasons to make the switch. With application hosting from Zsah, our dedicated teams work with you right from the start to design and build the right cloud infrastructure for your organisation’s precise needs. Get in touch with us today to find out more about our private cloud SaaS hosting solutions, and how we can help you create a custom private cloud perfectly suited to your organisation and your customers.